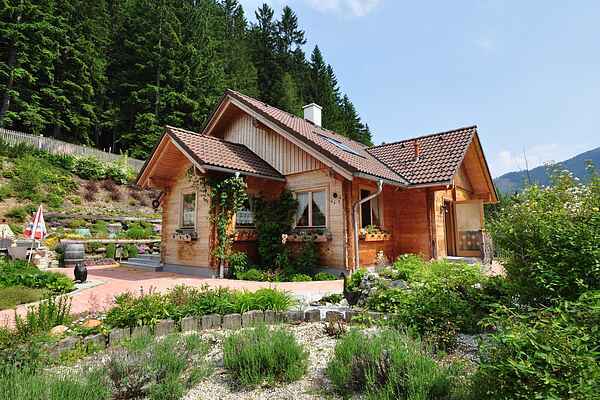 This chalet is situated in a very peaceful location, 1250 metres high and surrounded by stunning mountains in the Hohentauern region. Discover the surroundings: whether you are here with family, friends, hikers, or mountain climbers, the Hohentauern boasts something for everyone. The chalet is located right next to a cross-country skiing trail and is roughly 1.8 km from the lift for the Hohentauern skiing area. The centre is approximately 2 km away. The Hohentauern skiing and winter sports area is well-kept secret for families and those who enjoy stunning, natural ski pistes in a friendly atmosphere. It's a small yet splendid skiing paradise! Those who enjoy other winter sports, such as hiking, cross-country skiing, and snowshoeing, will love it here as well, amidst the gorgeous natural setting and peaceful winter landscape. The wooden chalet is warmly and comfortably decorated. All your adventures will start from the ground floor which, with 3 bedrooms, a fully furnished kitchen, and a charming "Wohnstuberl" (authentic Austrian living space), is perfect for 5 to 7 people. The large garden surrounding the chalet provides you with a great deal of peace and privacy, as well as a grill and pizza oven for you to use. In the winter, Styria transforms into the "white heart of Austria", with its wonderful ski resorts. In summer, the region is popular for its many lakes, spas and the impressive Hohe Tauern mountain range. More than 200 sunny days per year and a skiing area with snow guaranteed make this a perfect holiday destination for all seasons.